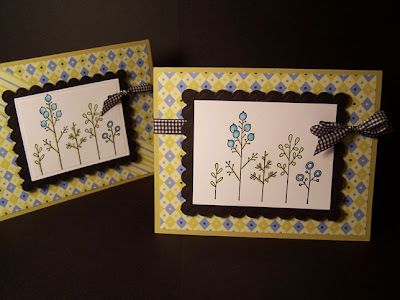 The sketch challenge on Splitcoast today is perfect for using the Try a New Technique challenge from Monday so I made a card using both challenges this morning. The technique challenge was to use the Dahlia Fold so I pulled out my SU Wintergreen papers and a circle punch and punched out 8 circles. I folded them following the directions linked on the site. 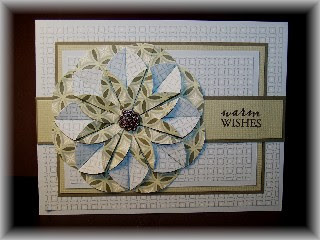 Then I added a brad to the center and tried to decide which papers to use for my card so the flower would stand out. I went with a SU soft sky card base with a layer of SU wintergreen paper. Then a mat of SU always artichoke with another mat of bazzill paper (not sure what color green). A mat of SU soft sky finished with another layer of SU wintergreen paper. The strip is SU always artichoke and more bazzill green. The warm wishes is from the Hero Arts Frames & Messages set. I went with "Warm Wishes" because the temp here today is 20 below zero with a wind chill factor of -40. All of the public schools are closed today due to the freezing temperatures. It's hard to believe that on Monday the temperature was 38 above zero. I must say it was a nice break from the cold even if it was short lived! I hope that wherever you are you are safe and warm! Thanks for stopping by. Just another quick post today. I was recently sent a bunch of scraps of papers. The one that really caught my eye was Amy Butler Dancing Mums paper. I had to pull it out and make a card. I started with a base of SU soft sky and layered the designer paper with a thin mat of Paper Source chocolate. Before attaching to the card base I tied the ribbon around the layers. To finish the card I stamped the greeting from Papertrey Ink's faux ribbon set in Stazon brown and matted with chocolate and soft sky using my Nestabilities. I didn't want to cover up much of the paper so I kept the card very simple. I really must find more of this paper. I think it might be my all-time favorite! Thanks for stopping. I hope you all are having a wonderful Monday. This is just a simple card using the Martha Stewart Candy shop pack of papers and the Hero Arts Frames and Messages clear set. Basically the same supplies as the candy box from yesterday since they were still sitting on my desk. 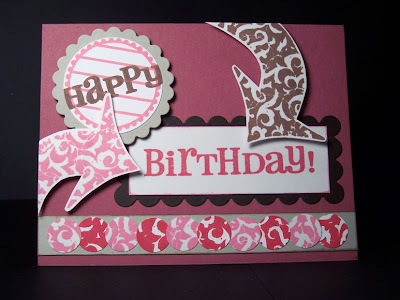 The birthday greeting is from Papertrey Ink's faux ribbon set and stamped in Ranger Seashell pink. The Hero Arts frame is stamped in the same ink and then just layered with the Martha Stewart papers and white cardstock. For the finishing touch I added a little ribbon. I think it's going to be a great weekend! After many days of temperatures below zero they are forecasting temps in the 20's for the weekend! I won't be surprised if I see someone out running in shorts at some point this weekend. Hopefully we've seen the last of the wind chill advisories for the season. I hope you all have a wonderful day! Thanks for stopping. I didn't get a chance to post my second project yesterday that I did so here it is. 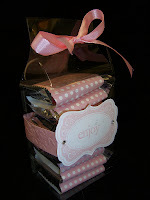 Have you seen all of the cute clear boxes made out of acetate sheets. I love the template that Lauren Meader created. Here's the link to the template on her blog. I decided to give it a try but instead of using Ghirardelli Chocolate squares I used York Peppermint Pattie Hearts. Eight of them fit nicely in the box. I covered each of them with a band of Martha Stewart Candy shop paper. The strip was cut to 4 1/2 x 2 inches and wrapped around each mint. For the top of the box I just used my crop-o-dile to punch a couple of holes to thread my ribbon through. The band around the box is also from the Martha Stewart Candy shop paper pack. For the label on the front I used my new Hero Arts Frames & Messages set. I stamped the frame and word in Ranger Seashell pink on SU Whisper white then cut it out and added a couple of gemstones for a finishing touch. This is not an easy thing to photograph but I'm really pleased with how it turned out. As always, thanks for stopping! Sorry, I didn't realize I haven't posted since Sunday. I am sitting here right now waiting for my camera battery to charge to I can take some pictures of the two projects I made this morning. I knew there was a reason I have started waking up at 4 am. It's so I can spend some time in my craftroom uninterrupted while everyone else in the house is sleeping (except the cat, who figures if I'm awake it must be time to eat so he wanders around the room meowing in hopes that I'll feed him). I ran to Michael's last night by myself and just took my time wandering around the store. I can't remember the last time I didn't have to rush my way through the store so it was a real treat to just be able to leisurely check out all of the aisles. One of the things I found was a small metal tub for $1. It rang up at 60 cents so it was an even better find! I used it this morning for one of my projects. I pulled out some floral wires and cut them assorted lengths and then I bent one end of each wire into a W shape to work as a foot so the heart would stand on it's own when set in the tub. Next I got out a variety of Cosmo Cricket papers and cut out 2 hearts from each print. I put two strips of tacky tape on each heart and sandwiched them onto the wire. 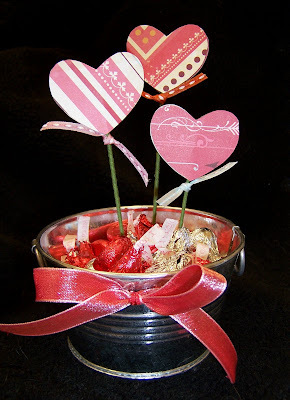 I added some May Arts ribbon to each heart flower and more to the metal tub. I used my crop-o-dile to punch holes and set eyelets in the tub and then ran the ribbon through the eyelets for the bow on the front. For the finishing touch I filled the tub with valentine kisses. I'm hoping to be back later today with the other project I did this morning. Ok, I'm trying to type and watch the Packer game so this will have to be brief. I made this card for my brother. He used to tie flies for fly fishing so these stamps from Inque Boutique are perfect for him. They are from the Gone Fishin' set. I used my Nestabilities to cut all of the circles first and then stamped the flies on the watercolor paper layer using Palette hybrid black. 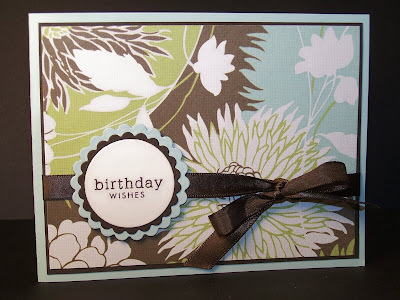 The next layer is Stampin' Up wild wasabi and the scalloped layer is chocolate from Paper Source. For the layer under the circles I stamped a larger fly in soft sky from SU onto soft sky paper and then layered that with chocolate also. The base of the card is wild wasabi with a mat of soft sky and BasicGrey periphery. As always, thanks for stopping. I have to get back to the game. It's a cold day here in Minnesota. Currently it is -15 degrees F with a wind chill factor of -33. We are under a WIND CHILL ADVISORY until noon on Sunday. For those of you not familiar, here is the warning we are given . . .
A WIND CHILL ADVISORY REMAINS IN EFFECT UNTIL 12 PM CST SUNDAY. 40 BELOW ZERO ACROSS THE NORTHLAND TODAY THROUGH SUNDAY MORNING. It's days like these when you want to curl up on the sofa with a blanket and a bowl of popcorn and watch movies. Now, on to my card. . . 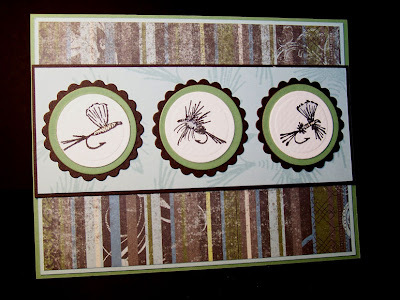 I made this card using more of my Inque Boutique stamps. The card base is rhubarb from Paper Source and the strip across the bottom is SU sahara sand. I stamped the arrow a couple of times on white scraps using Colorbox chalk rouge and warm red and then punched out circles from them and mounted them on the strip of sand. Birthday is stamped in warm red and rouge is sponged around the edge. I layered that on a piece of chocolate from Paper Source that I cut out using my Nestabilities. I just cut it down to make it the right height. I also used them to make the circles. The scalloped circle is sahara sand. 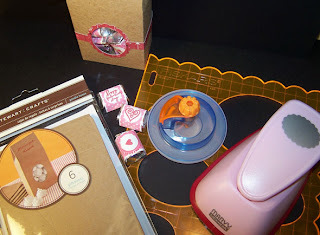 For the white circle I stamped the journal lines with rouge and the Happy with chestnut roan. This piece is mounted with pop dots. The arrows are stamped with chestnut roan and rouge and mounted with pop dots also. Be safe and stay warm today! Thanks for stopping. I'm still playing with my stamps from Inque Boutique. There's just nothing quite like free stamps. There's more about my stamps on this post. Anyway, For this card I stamped the flowers from the Bella Flora set in SU cool caribbean and then stamped the quote from Quotopia in Palette hybrid black on white. I sponged around the edges with black and mounted on a thin mat of black and again on cool caribbean. I left the bottom panel long to I could add a ribbon. Then I made my card base from SU soft sky and cut a black mat. I sewed around the black mat a couple of times before adhering it to the card. Just a simple little card. As always, thanks for stopping. I am loving my Nestabilities. I haven't mastered the right combination for great results with the embossing yet but I'm enjoying them just the same. Currently I have the rectangle sets and the circle sets. Eventually I hope to have the squares and ovals too. The price is really reasonable when you consider the price of punches. And storage space isn't an issue with them like it is with the punches. Ok, on to the card. 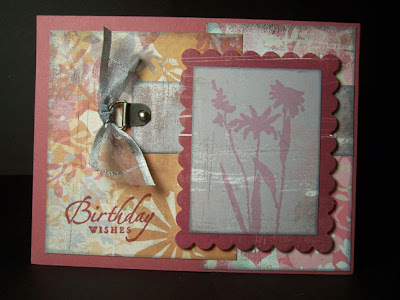 I used a variety of papers from the BasicGrey Perhaps collection and the card base is Rhubarb from Paper Source. I sponged all of the BasicGrey papers edges with Ranger Distress ink in weathered wood. Then I added some hodgepodge hardware and ribbon and stamped the greeting from SU Sincere Salutations in Colorbox chalk maroon ink. The flowers are stamped with Colorbox chalk pink pastel. The flower stamp is from my "tester" set from Rubber Stamping Fun. This set is not yet available for purchase. Thanks so much for stopping. Enjoy your day! 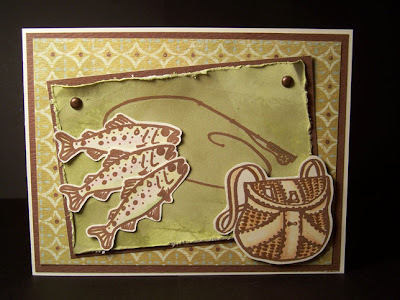 I had to make a card using my new Gone Fishin' set from Inque Boutique. I love this set. I stamped the fishing rod with Colorbox chalk chestnut roan on very vanilla then covered the piece with Tim Holtz peeled paint distress ink. Then I distressed the edges with my Heidi Swapp edge distresser and mounted it on the reverse side (solid brown) of the patterned paper (Tres Jolie Oui Oui "Brothers" Circles). Next I stamped the creel and fish on vanilla paper with the same ink and colored them with my prismacolor pencils and gamsol then I cut them out and set them aside. 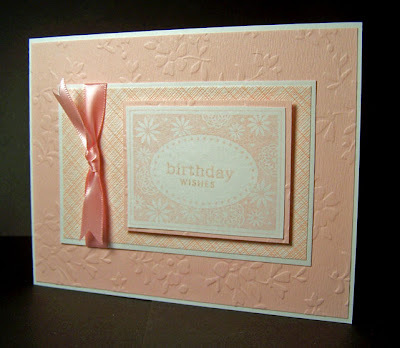 I used vanilla for the base of the card and layered on the designer paper from Tres Jolie. Before adding the center piece with the fishing rod I attached a brad to each top corner. Once the main panels were all adhered I added the fish, then mounted the creel on pop dots. Thanks so much for stopping by. Sorry for the lack of posts lately. It seems that the new year is getting off to a busy start. I pulled out my Quotopia set from Inque Boutique to make a card. In case you can't read the quote it says - You just have to do your own thing no matter what anyone says. It's your life. 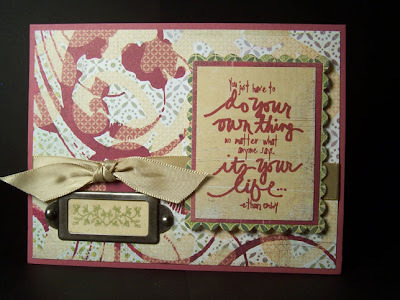 I stamped the quote in colorbox chalk maroon on basic grey blush paper. I matted that on two more layers of papers from the blush collection. I used my nestabilities to cut out the scalloped rectangle for the largest layer. 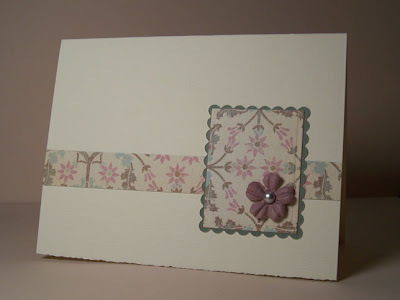 The card base is rhubarb from Paper Source with more basic grey perhaps paper layered on it. I added the ribbon and then the hardware with a rub on from K-ology. I'm attending an all day training session today so I just have a minute to post today during my lunch break. I've been wanting Rockabella so when Emily had her free shipping sale I broke down and placed another order. I stamped her with Palette hybrid black and colored her with copic markers. For the glitter on the guitar and in her hair I used my Twinklette marker. The star is Scenic Route chipboard covered in BasicGrey paper. 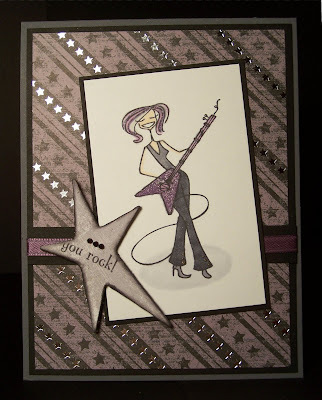 Then I stamped the sentiment from Stamping Bella and added some black gems. The background paper is from DCWV mounted on a layer of black with the card base being SU basic gray. 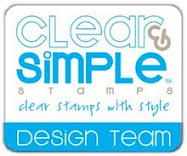 My latest order of stamps from Stamping Bella finally arrived so I got busy and inked them up. I wanted to make a nice glittery snowboard for Daisyboardabella so this is what I came up with. I stamped her in Palette Hybrid black ink on SU whisper white cardstock and colored her with prismacolor pencils and gamsol. 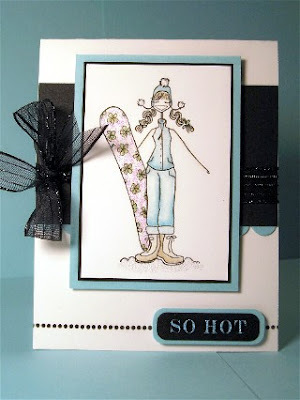 I added frosted lace stickles to her hat and crystal stickles to her snowboard. I matted her on a SU black and cool caribbean. The used a white card base and added the cool caribbean scalloped border under the black layer using MJ's cool technique that she shared on her blog Beauty Lies Within. The ribbon is from Pink Hedgehog Paper Crafts. On the bottom of the card I stamped a row of dots using the faux ribbon set from Paper Trey Ink in Palette hybrid black. The SO HOT is a rub-on from DCWV All Dressed Up which I layered on to cool caribbean and cut out. I thought she looked pretty hot in her little outfit with her glittery snowboard. I'm on my way out the door so I just have a moment to post this card I made yesterday. I used a cream notecard and added a strip of My Mind's Eye Mademoiselle paper and then used my Nestabilities for the rectangles. To finish it I added a prima with a dew drop in the center. I think I'll make more and package them as a notecard gift set. Elizabeth M. from Duluth, Minnesota! I won $50 in stamps from Inque Boutique! I love their stamps. They are unmounted rubber but come sticky for use with an acrylic block. The best part is they print the image on the reverse side so you can clearly see the image through the block. Check them out! Thanks for letting me share my news! I tend not to make one layer cards because I generally don't think they look finished enough but now that I have purchased some beautiful note cards I am planning to do more one layer cards. I really think the key to one layer cards is having a beautiful base card. 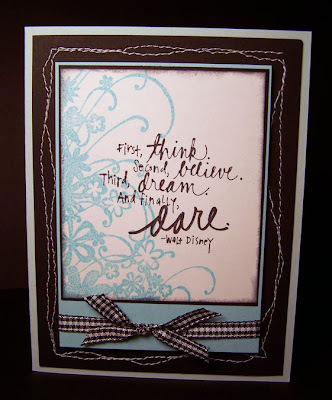 For this card I stamped the heart flowers from Studio G in Palette hybrid black and colored with reinkers. 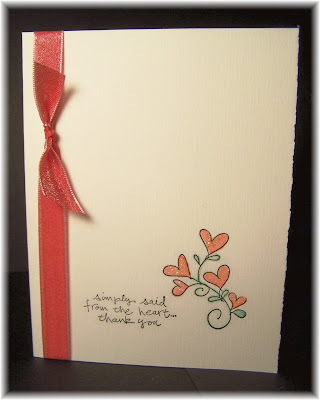 I also stamped the thank you saying from the Stampin Up Simply Said set. For finishing touches I added icicle stickles to the hearts and tied May Arts ribbon around the card front. I purchased the note cards from Paper Depot in Minneapolis. I don't no who makes them as they are sold by the pound and there are no labels on the shelves. When I was in Michael's the other day the Martha Stewart Goodie Boxes were on clearance for a $1. They come in a package of 6 in either craft or white. Needless to say, I bought a few packages since the clearance price was about 15 cents per box. I decided to make a valentine treat box for my first project with them. I pulled out some Cosmo Cricket paper from the Hey Sugar line and cut a rectangle (2.5 in x 3 in). In the center of the rectangle piece I cut a 1 1/2 x 2 inch oval using my Fiskars oval template and cutter. Then I inserted the rectangle piece with the oval cutout in my pink Marvy scallop oval punch, centered it and punched it out. This ended up creating a nice frame for the window on the box. I also added a 1/2 inch wide band around the box. For the finishing touch on the box I added a ribbon to the top. I filled the box with Hershey nuggets covered with Avery mailing labels. 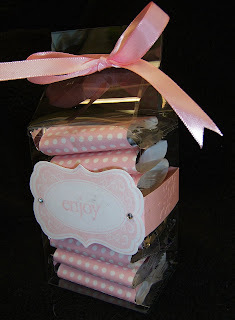 I stamped them with the polka dot stamp from Clear Dollar Stamps You're so sweet set in Colorbox chalk rouge. 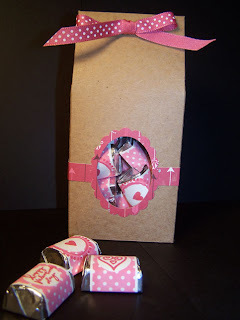 Then I stamped a variety of stamps in the centers of each candy using Colorbox chalk warm red. I think I'll get some good use out of these boxes. I just love this Row of Winter Trees stamp from Stampendous. I thought if I made the berries blue then it wouldn't have to be a holiday card so here are a couple of simple designs that I think would work well for thinking of you cards or thank you cards. I stamped the trees on SU whisper white using palette hybrid black ink and colored them with my prismacolor pencils and gamsol. Then I added a black layer using my nestabilities. The designer paper is from a swap so I don't know the maker and the card base is cardstock from my local stamp store. To add the ribbons I punched a hole in the image panel to thread the ribbon through. As always, thanks so much for stopping!